From a Cajun family, Desormeaux grew up on a farm where he was first introduced to horses through 4-H. He first raced American Quarter Horses and was only sixteen years old when he began working as an apprentice jockey at the Evangeline Downs racetrack in Lafayette, Louisiana. He won his first career stakes race on December 13, 1986, riding Godbey in the Maryland City Handicap at Laurel Park Racecourse. His immediate success led to him moving north to compete on the Maryland racing circuit in 1987 where his performance earned him the Eclipse Award for Outstanding Jockey in 1989 and 1992. In the early 1990s he moved to southern California and rode Kotashaan to victory in the 1993 Breeders' Cup Turf and at the end of the year his peers voted him the prestigious George Woolf Memorial Jockey Award. 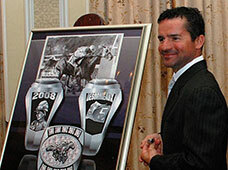 In 1998, Kent Desormeaux rode Real Quiet to victory in the Kentucky Derby and the Preakness Stakes. 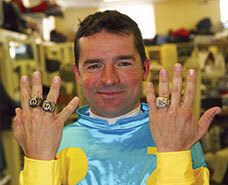 In 2000, Desormeaux won the Wood Memorial Stakes and his second Kentucky Derby aboard Fusaichi Pegasus. In 2008, Desormeaux won his third Kentucky Derby aboard Big Brown, in a time of 2:01 4/5. Big Brown won by just under five lengths. Desormeaux followed this victory with his ride on Big Brown to victory in the Preakness Stakes at Pimlico Race Course in Baltimore, MD in a time of 1:54 4/5. ©2019 The Bill Hartack Charitable Foundation.